Too windy yesterday and today for trapping with mistnets. There was around 50 Bar-tailed Godwits at Revtangen though, and we put out 8 walk-in traps between 08-14, mainly aimed at the godwits. Ringed: Dark-bellied Brent Goose 1, Dunlin 17, Bar-tailed Godwit 30, Common Redshank 1, Turnstone 2, Rock Pipit 1. Total = 52. Also a control of a 1 cy Dunlin not from Revtangen. The Dunlin-total for 2017 now stands at 1007. Adult female Dark-bellied Brent Goose. The eastern ssp. 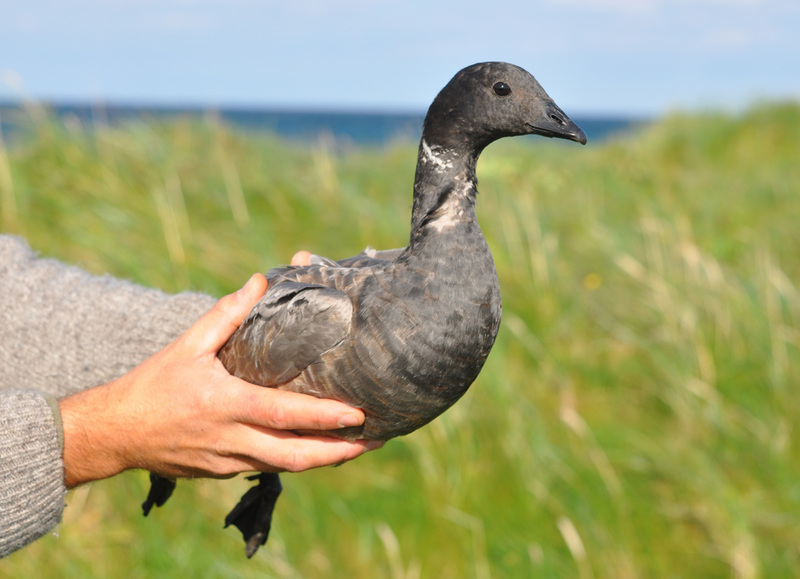 is a quite scarce migrant in Norway, and this is only the 3rd ever ringed in the country. Ringgås, adult hunn av underarten bernicla. Observations: Bird Observatory garden: Yellow-browed Warbler 1, Spotted Flycatcher 1. Haavard Husebö and Alf Tore Mjös. 5 visitors.